Hospitals, especially private ones can no longer demand deposit or initial payment before creating emergency cases. 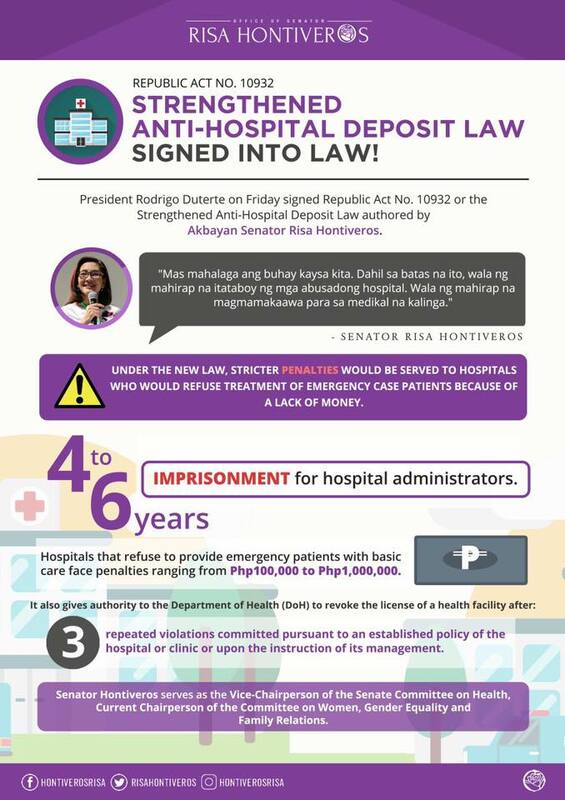 This is another good news after President Rodrigo Duterte signed into law a bill providing higher penalties for hospitals and clinics that refuse to treat emergency o serious cases without a deposit. 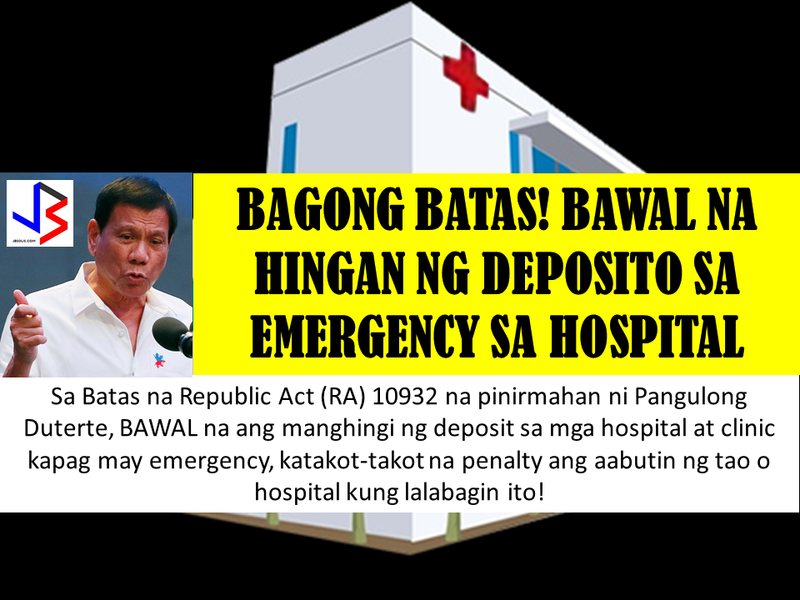 The penalty is also much higher against any medical practitioner or employee of a hospital or medical clinic who will violate the Anti-Hospital Deposit Law. Violators of the law will either face prison time of six months to two years and four months, a fine of P100,000 to P300,000, or both. 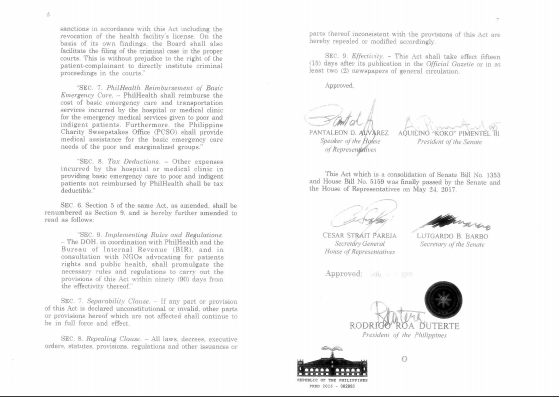 The previous penalty under Batas Pambansa 702 as amended by RA 8344 is P20,000 to P100,000. 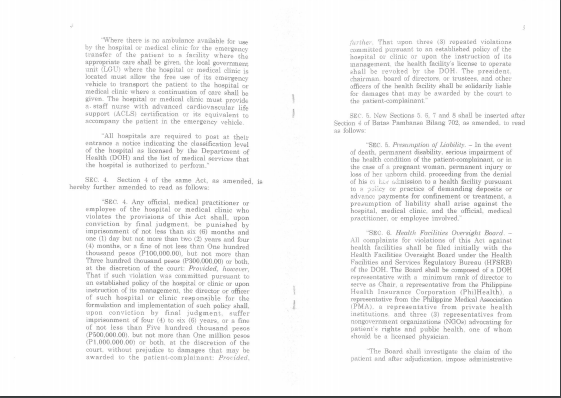 If proven that the violation of the law was committed due to the hospital’s established policy, the director or officer of the hospital or clinic responsible for the formulation and implementation of such policy shall be fined with P500,000 to P1 million. The previous fine for them was set at P100,000 to P500,000. A judge also has the option to penalize the violators with imprisonment. The law can also now cause the revocation of a hospital or clinic’s license to operate if the violation of the law was repeated thrice. 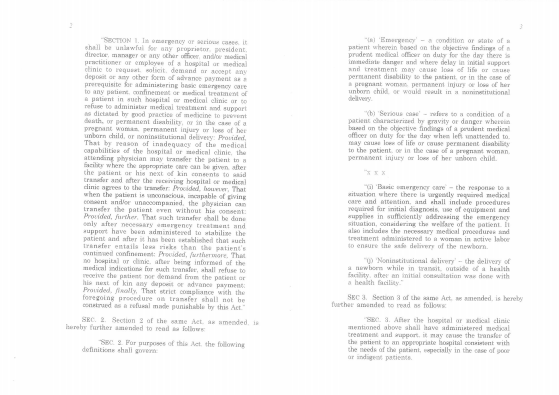 "a hospital or clinic shall be held liable in case of death, permanent disability, serious impairment of the health condition of the patient, or in the case of a pregnant woman, permanent injury or loss of her unborn child, proceeding from the denial of his or her admission to the health facility." If the hospital or clinic's facilities are inadequate for the treatment, however, the attending physician may transfer the patient to a more capable clinic after consent has been given. The law also says the local government unit "must allow the free use of its emergency vehicle to transport the patient" if no ambulance is available for use during the transfer. A staff nurse with advanced cardiovascular life support certification or its equivalent must also accompany the patient in the vehicle. 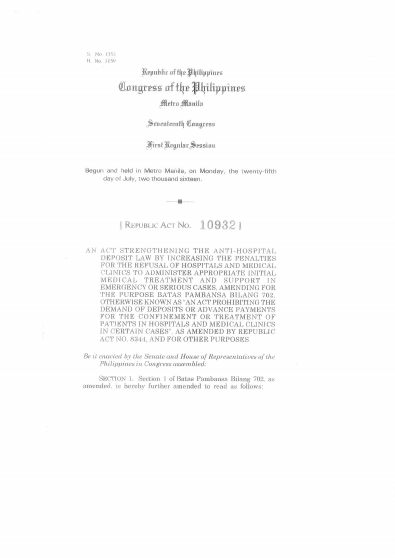 The law also mandates that all complaints about violations of the law shall be initially filed before a health facilities oversight board under the Department of Health. Sen. Risa Hontiveros, author of the law and vice chairperson of the Senate Committee on Health, thanked President Duterte, saying it is very important especially for the poor.